Have a look to the GDAMS 2017 Map of actions worldwide! GDAMS 2017: Download the Final Report! Women in Black ask to move military budget to ensure public education, ensure complete health care for women who are victims of violence, and public works to ensure the access to basic services. 22th April 2017: Sidney Demonstration, Town Hill Sq. : Move the money to social welfare. Almost 200 people marched through Brisbane on March 25 as part of the March in March mobilisation. The congregation of the Melbourne Unitarian Church and guests came together on April 23rd at the invitation of the Campaign for International Co-operation and Disarmament (CICD) to hold aloft signs saying ‘Move the Money project –If I had $67 billion I would spend it on HOUSING, REFUGEES,EDUCATION and HEALTH. Street presence during the busy lunch hour, with all those banners on display. The street presence was preceded by a coffee house briefing on foreign affairs issues from the Greens Senator, Scott Ludlam. As well as handing out a flyer, we were also asking people how they would prefer to spend the $67billion which is currently in our defence budget for F35 jet fighter and submarines. We got some interesting answers, which we will forward to our foreign Minister. A few people said they totally approved of that spending, but most realised that such huge expenditures on items which suit the U.S. military agenda, and which do not even contribute to the defence of Australia, could be much more usefully spent on things like health, education sheltering homeless people, being kinder to refugees, ensuring that we have a good public transport system and so on. Link to Photos (Photography: Desire Mallet): look at them here! Working for an independent Australian foreign policy, a cessation of our current disastrous wars, and diverting greater resources from war and its preparation, to much needed social services like health, housing, climate change, education, NDIS, domestic violence mitigation, childcare, indigenous wellbeing and other urgent social needs. Have a look at the flyer! On April 7th, Parlamentarians for Nuclear Non-Proliferation and Disarmament (PNND) spoke about this to 350 university students and representatives of youth organisations at a forum on nuclear disarmament and sustainable development at Dhaka University. A Statement on military spending in Cameroon will be produced and shared. On 3rd March the members of the Canadian Voice of Women for Peace (VOW) wrote a letter to the minister of the defence department Harjit Sajjan, to protest the dangerous and destabilizing Canadian Armed Forces’ (CAF) overseas operations and to call for a reduction of military spending and a re-allocation to urgent social and environmental needs. Read Voice of Women for Peace news on GCOMS! At the Halifax event, the public was given the opportunity to identify their priorities for taxpayer spending, by placing 25 cent quarters (supplied by NSVOW) in jars labeled: Arts & Culture, Environment, Health and Education, Military, Peace, and Women & Children. Organized by Science for Peace and Voice of Women, Gretchen Roedde was a guest speaker at this event for the Global Day of Action Against Military Spending. Serpaj Chile will do actions and pression on the gevernament to reduce the military spending. Esbjerg Peace Movement will have a public arrangement on Friday, April 21st at the central square in Esbjerg. by placing a vote into to different measure containers representing the two different options. You can get chitchat and a cup of coffee/tea and a small bisquit in the cold weather with the never stopping west wind!! Peace Union of Finland and Committee of 100 organize a Press Seminar on Military Expenditure. Speakers: Tarja Cronberg and Timo Mielonen. Cronberg is a chairperson of Peace Union of Finland and a Distinguished Associate Fellow with SIPRI. Mielonen is a chairperson of Committee of 100. Helsinki: 29 April at 14:00–23:00 Rauhanasema Veturitori 3, 00520 Helsinki Bikes Not Bombs Fest! Read the GCOMS Statement in French! Meeting in the municipality of Ancient Olympia on April 29, with the presence of vice minister of Education and local authorities. -feminist collective The Purple (http://tomov.gr/). With a central demand to reduce military spending and increase social spending, we wore white masks emphasizing that we are not invisible, we opened up gigantic ‘There are no money’, we planted flowers in military helmets with the painted sign of peace and play poems. Press conference on the occasion of GDAMS 2017. On 18th , 19th and 20th April 2017, Two workshops have been organized in connection on the Global Days of action on Military Spending (GDAMS)-2017. Three Budget experts, had also actively participated in our workshop and village rallies. We had discussed in detail about our Military Spending expenses on – Huge Forces, Missiles, Aircraft, Guns etc, Whereas, our Poverty alleviation activities expenses ( Millennium Development Goals etc.) are very low . And therefore, there is no need to heavy expenditure on Military Spending expenses in our country, India. Our all taxes are going on Military expenses, Weapons, Warfare preparation, instead of to solve the drinking water, Health and food problems, Literacy etc., So we are living in very bad condition and we should put the pressure to our Government through Members of Parliament – MP, MLA and elected leaders, that they must deduct (reduce) the Budget of Military Spending and this money should be used in Community Development activities – MDG activities. Energy Crises, Creating of new jobs for youths or tackling poverty and climate change problems and other social issues. Priorities must be fixing in connection of our National Agenda or Development agenda. Our GDAMS –Campaign and workshop news have also published in News papers as well as broadcast in local TV and Radio and due to this efforts, a very good environment have become formed in our region and discussion is continue in educated people , Youths and activist. On Military Spending –GDAMS-2017. Our all activities will be continuing in whole week from 18th April to 27th April 2017. We have also action plan for whole one year 2017-activities on this issue through our Social activist and well wishers and local NGOs in Rural areas. Women rally on Global Military Expenditure 2017 and our drinking water and health problems. The goal is to pressure to our MP, MLA and elected Leaders to attention our government in this regard. We need seeds for agriculture and irrigation facilities for agriculture and not Weapons. We have to mobilize and put the pressure to our elected leaders to reduce our Military Expanses and to use this money for our development activities . The rallies took place in the Mandar-Gar and Jaspura villages in the Kota District, Rajastha. About 175 rural youths, farmers, women, and girls and boys actively participated in the campaign. All the participants made a vow that they will not tolerate armed violence or the misuse of guns in their communities. Discussion in a village meeting about future plans on the Global days of action on Military Spending. Discussion with village Leaders on global military expenditure and our drinking water and health problems issue. The objective is to pressure our MP, MLA and elected Leaders to focus their attention to these problems. On the 15th of February the Observatory on Italian military expenditures presents to the Parliament its firs report on the Italian military expenditures. In this report there is also a focus by Pere Ortega of the Centre of Peace Studies J. M. Delás on Spanish military expenditure. For the year 2017 Italy has destined around € 23,3 million to the military expenditures, equal to over 64 million € a day. In comparison to 2016 a light increase is recorded. These are some of the data contained in the Report Milex 2017 on the Italian military expenditures. The expenditure grows instead for the weapons justified by struggle to the terrorism, to contrast the immigration and crime. Italy: Pisa: Italian activists ask for more and better jobs and for civil peace corps. The NGO Un Ponte Per asks to move the money to more and better jobs and to fund the civil peace corps. The Rete Italiana per il Disarmo is promoting the Selfiecampaign and it is sharing the Infographs with all its partners. On May 1st Iraqi Social Forum and Iraqi Civil Society Solidarity Initiative-ICSSI asked to move the military spending to employment policies based on rights and not on profits. And the Iraqi Social Forum activists from Baghdad have many more proposals. Hamushim activists delivered to the Technion hundreds of letters petitioning against their arms trading course “Defense Strategy for International Markets”. Peace Boat’s 94th Global Voyage for Peace will depart from Yokohama, Japan on April 12 and will return on July 25, 2017, taking a northern route around the globe. Participants will learn about the history of modern Europe and the diverse cultures that constitute it. The voyage will also visit the ports of Porto, Rouen and St. Georges for the first time and return to favourite destinations in the Americas, such as Corinto, Nicaragua and Acajutla, El Salvador. On April 26, a session was held with participants of Peace Boat’s 94th Global Voyage as the ship was at sea, during which SIPRI’s newly released 2016 data on global military spending where presented and discussed, in the context of the level of spending for education and social welfare, as well as current needs for responses to famine, conflict resolution, environment preservation and other global concerns. Kazakhstan renewed its call for a cut in global military spending on the Global Day of Action on Military Spending (GDAMS) in an April 24 statement published by the country’s Foreign Ministry. April 24: Declaration on the occasion of the new SIPRI’s data release by Aotearoa New Zealand Campaign on Military Spending. April 28th: A second Forum was held on April 28th, the last day of GDAMS this year. A lunchtime forum on government spending priorities – join us for a discussion on social spending, with Paul Barber, Policy Advisor, New Zealand Council of Christian Social Services, vs military spending, with Edwina Hughes, Coordinator, Peace Movement Aotearoa. ~ BYO lunch, tea / coffee available. On April 18th, the first Waiwhetu Lower Hutt Peace Group meeting this year was helded on the first day of the 2017 Global Day of Action on Military Spending fortnight of activities, with a presentation by Edwina Hughes, Coordinator of Peace Movement Aotearoa (which coordinates the Aotearoa New Zealand Campaign on Military Spending). The pervasive costs and consequences of militarisation in times of peace are often overlooked when compared with the attention given to the tragedy of armed conflict and war. Edwina ‘s presentation provided an overview of those costs and consequences – globally and in Aotearoa New Zealand – in relation to social justice, the environment, climate change, attitudes towards violence as a means of resolving conflict, and the increasing level of militarisation of children and their education here. The presentation concluded with a brief outline of the outcomes of the nationwide consultation with peace and faith groups to develop responses to the World War One centenary which led to the World War One Centenary Peace Project, and some of the peace events that will be held in the Hutt / Wellington region during April. 3) Advocacy visit to the Mayor/Deputy Mayors of Ogori/Magongo Local Government Council,Kogi State. 4) Interview with the schools Principals. 5) Advocacy visit the Traditional Rulers in Ogori/Magongo Local Government Council. 18:00pm: GDAMS Meeting at Kongsberg Town Hall. Fresh data on world military expenditures will be presented by Alexander Harang, President of the Norwegian Peace Association. The Art Project Annex will also present its work. We will have an open debate on Norway´s military expenditure, and the current political climate for further armaments. GDAMS lecture at Tromsø University by Fredrik Heldal, Director of the Norwegian Peace Association. In cooperation with Center for Peace Studies at Tromsø University. – April 18 – Street play production in an urban community setting with youth and students culminating the event with jamming with alternative artists. A VTR will be produced. It will be used by other groups during focus group discussions in other communities and schools during the GDAMS days. – Two public actions in the Mindanao area: in a farming community of women and with urban youth and students group. – Media blast during the GDAMS days. The statement claims for the right of World’s people to live in peace and for the necessary and immediate changes in immigration policies that now sentence to death millions of people who simply try to scape from war, persecution and hunger. Listen the podcast at this link! Discussion on Military Spending during a “slow coffee”, Las Palmas de Gran Canaria. Conference with Colin Archer: Militarized States. What can we do from a Global Justice perspective? Organized by LaFede.cat (Catalan Federation of Organizations for Global Justice). With the cooperation of Delàs Center for Peace Studies, Novact, Fundipau, Unipau, Justícia & Pau and Escola Cultura de Pau. Bike March, starting at 11am from the Palacio Foral Bizkaia “Diputacion” to go to the Arms Factory Precicast PCB in Barakaldo. Ending at Getxo, at the entrance of Sener, a company involved in arms production. This is the 10th Bike March against Military Spending and Military Industry. The initiative is promoted and organized by several anti-militarist organizations together with ecologists and internationalist solidarity groups in Bizkaia. Read more (in Spanish), here! The Parliament of Navarra approved a Statement against Military Spending and Weapon Investements. Fund peace and reconciliation, not the military! On April 27, as Peace Boat called to Sri Lanka, a delegation of A-bomb survivors travelling as part of the “Peace Boat Hibakusha Project – Global Voyage for a Nuclear-Free World” visited the Office of National Unity and Reconciliation and held an exchange with youth from the organisation Sri Lanka Unites on the themes of reconciliation, justice, forgiveness, and inter-ethnic/inter-faith understanding at various levels of society. As part of a joint exercise on the kind of future they want and the transformative role they can plan, the group made clear that the level of global military spending does not reflect their priority of achieving peace and reconciliation. On April 21, the Peace Educators Movement will organize, together with the Cultural institution Space Mixtura, a Fair in the framework of the Days of Action Against Military Spending. The Fair will include an exchange of war toys by books, for the children. At St Joseph’s School and site of Pax Christi office in Hendon London, staff and pupils of the school came along to cast their vote for a safer world. As well as showing curiosity about what was going on, 94 people took part in the vote and you can see the results in the photograph. Read the results of the survey. Morevover, GDAMS Supporter Conscience have a new date for their Taxes for Peace Bill: it was rescheduled for the 24th of March 2017! In preparation, they had a public meeting at Friends House, Euston Road on 27 February 7 – 9 pm. Focus on the true costs of military spending. And, on 26th April, From 6 to 7 pm next to Edith Cavell statue – Women in Black asked citizens where they would move the military money. 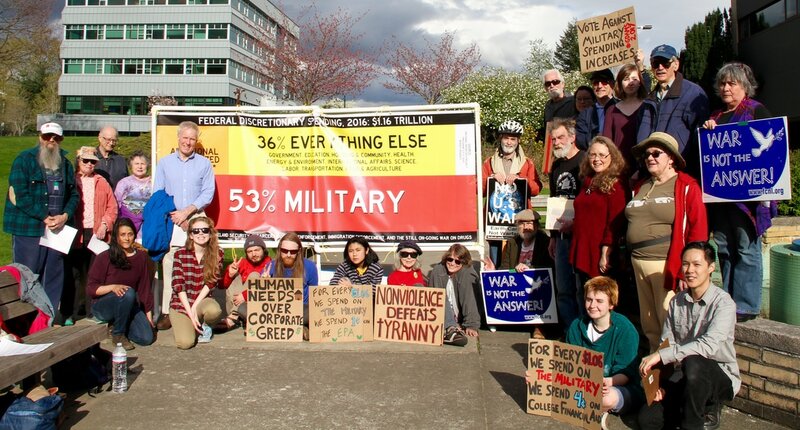 Over 30 people gathered on the Walpole Common on Saturday, April 15, 2017, at a peace vigil standing in solidarity with the Global Campaign on Military Spending and the Tax Day 2017 Mobilization, calling for a reduction in military spending and a redirection of those funds to human services. Sponsored by the Walpole Peace and Justice Group, a 40 foot banner was held showing where the Federal discretionary budget is spent today based on the 2017 budget. The banner consisted of colored panels, each representing a budget category like military spending and education, with a length proportional to the size of each budget. The U.S. military spending is more than 50% of the Federal discretionary budget. It equals the combined military spending of the next eight countries, including China, Saudi Arabia, Russia, the United Kingdom, and India. The vigil was also calling for President Trump to release his tax returns and was opposing his proposed 2018 budget cuts to human services like housing, senior programs, the National Endowment of the Arts, and the EPA. The Pentagon’s budget equals the combined total of the next eight largest military spenders, including China, Saudi Arabia, Russia, the United Kingdom, and India! We will have a 40 foot budget banner that shows where the Federal discretionary budget is spent today. We will also have a couple of brief speeches and will pass out an informational leaflet urging people to call our U.S. Senators and Representatives. We may also have some drummers! About 3,000 people attended the demo and Tax Rally in Cambridge Common, emceed by State Representative Mike Connollly. Link to the pictures flickr stream. Look at them! With speech from Joseph Gerson. Read it! Beach north of the Santa Monica Pier, Site of the Veterans for Peace Project called “Arlington West” – a cemetery on the sand. You will see a sea of white crosses just to the right (north) of the pier, in the sand, with several tables and exhibits set up by Veterans for Peace detailing the costs of war. Our group, the Southern California War Tax Resistance, will have our own table there, with full support of VFP. We will gather at 2:30 PM and at 3 PM will host a public event of war tax redistribution to give out checks of resisted war taxes to local groups supporting peace and justice. We’ll have lots of information on where your taxes are going now, and ideas on where you might rather spend them. Join our Pat-RIOT’s day march, April 17th at 11am at Bridge St School. We will Meet-up at 11:00am. Speak Up and Sing Out in front of First Churches (129 Main Street). 12:00 noon is the Anti-war Peace “Riot”. Organized by the American Friends Service Committee, Western Massachusetts Program. Members and friends of the Mt. Diablo Peace and Justice Center distributed flyers at all of the Contra Costa County BART stations. Link to photos from the event. Look at them! April 2017 is the 50th anniversary of Rev. Martin Luther King Jr.’s speech “Beyond Vietnam: A Time to Break Silence”. In it, Dr. King confronted the deeply rooted racism, militarism and materialism in the U.S., describing our government as the greatest purveyor of violence in the world. Fifty years later his analysis and call to action is as relevant now as it was then. Sponsored by the National Council of Elders and Western States Legal Foundation, and Co-sponsored by Ecumenical Peace Institute/CALC, Mt. Diablo Peace and Justice Center, Nafsi Ya Jamii, Physicians for Social Responsibility (SF-Bay Area Chapter), Tri-Valley CAREs, Women for Genuine Security, West County Toxics Coalition, Women’s International League for Peace and Freedom, East Bay Branch and Women’s International League for Peace and Freedom, San Francisco Branch. 18th April 2017 from 5 to 6pm. Lottie and Grand Avenue in Bellingham, WA. Event hosted by the Whatcom Peace & Justice Center and Veterans for Peace Chapter 111. Read more on the action and watch the video! 18th April 2017 from 12 noon to 1pm. 1. The dates: This year’s Global Day/GDAMS will not in fact be a day but a fortnight! It will be held from April 18th – 28th. On the 24th, the Stockholm International Peace Research Institute (SIPRI) will publish the global military expenditure figures for 2016, together with its analysis of the trends. The 18th is Tax Day in the USA, a traditional moment in the calendar for civil society to challenge the uses put to public money. Those ‘Global Days’ offer our participants more scope to choose a suitable moment to organize events that fit local or national contexts. As usual, IPB will publish all events that are notified to us as being within the GDAMS framework. 2. The context: There are plenty new reasons to renovate our call for a cut on military spending. We are increasingly immersed in a world that is based on divisive rhetoric, hate speeches and xenophobic thinking that lead the world in a separation between good and evil and support the on-going military campaigns – and the increased budgets to support them. We are also facing a situation where the newly elected US president is signing amendments that increase the military budget and deny human rights; Europe is planning to fund research for military goods which the current proposal for a fully-fledged European Defence Research Programme (EDRP) amount to 3,5 billion EURO. Moreover the deterioration in China-US ties, with a particular emphasis on maritime security, makes the world even more dangerous. Nevertheless there are large sections of the population who have serious doubts about the wisdom of the policies of this time. For all those reasons we urge our partners to reach out as widely as possible to other sectors of civil society, to draw in support for our message, and to help organise really effective GDAMS events. 3. The committee: We have re-convened the International Steering Committee that has worked successfully over the past few years in helping the IPB Secretariat with the coordination. The international campaign coordinator for this year will be the Centre Delas for Peace Studies in Barcelona.